ST. GEORGE — It’s a tradition dating back 60 years. 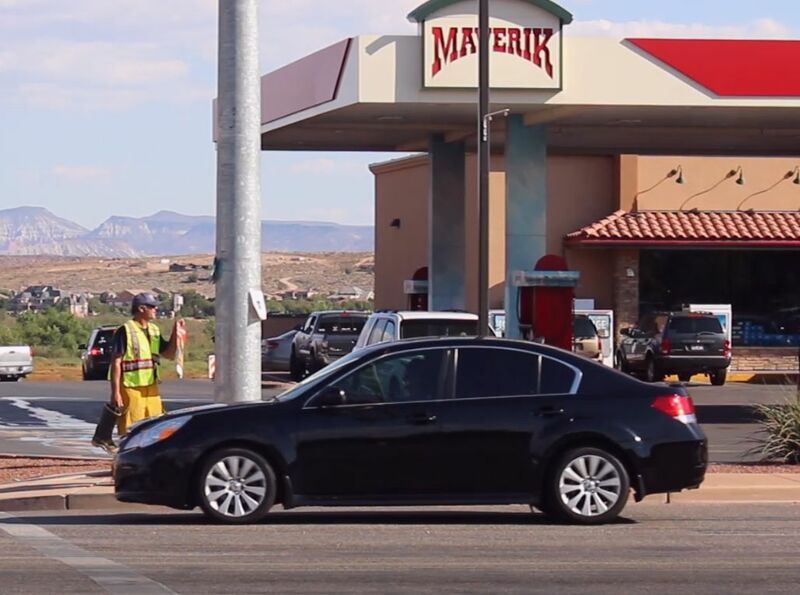 Firefighters stand on street corners across the United States and mingle in and out of traffic asking motorists and others to help them “fill the boot” for the Muscular Dystrophy Association. This year, St. George firefighters from Station 6 were on the corner of Mall Drive and Riverside Drive. As cars came to a stop at the light, firefighters walked up and down the sidewalk and in between traffic with a boot, asking for donations. “It’s helping with medical costs for families that get into a desperate situation, that we’re able to help them out as firefighters across the nation,” St. George Fire Capt. Clint Gafa said. Gafa said the yearly event raises on average between $7,000 to $10,000 locally for the MDA, adding that firefighters enjoy the yearly event and look forward to its occurrence. You probably think it’s a scam because you haven’t been educated about it. Well here is a little fireman involvement history. In the early 1950s, several important sponsors became long-standing allies of MDA, including the Tall Cedars of Lebanon of North America, the National Association of Letter Carriers (NALC) and the International Association of Fire Fighters (IAFF). The NALC quickly established a nationwide door-to-door campaign for MDA and continues to support MDA as a national sponsor today. In the same time frame, a group of families affected by muscular dystrophy approached Local 718 fire station in Boston to ask professional fire fighters to help fight muscular dystrophy. Responding enthusiastically, the fire fighters took to the streets with their boots in hand to ask greater Boston to make donations that would be used to fight muscular dystrophy. The Fill the Boot campaign was an instant success, with the IAFF membership passing a resolution to support MDA’s fight against muscular dystrophy until treatments and cures are found. More than 60 years later, IAFF continues its tradition as the top fundraising organization for MDA today, raising more than $26 million each year to help MDA families live longer and grow stronger. Per Charity Navigator , the MDA spends over 25% of donations received on administration and fund raising expenses, earning only two stars out of four. I’m sure its administrators are well paid. While the cause is deserving, the MDA is not the kind of charity that attracts my contribution. But to each his/her own. I have been educated about it and that’s why I know it’s a scam ! Short, emotional comments are always entertaining, but providing a little substance to a comment is better. On speaking of scams, I’ve often wondered that for over 50 yrs there have been countless fundraisers for Cancer, MDA, and many other health conditions raising billions and trillions of dollars. So why hasn’t even one of these causes found a cure yet ? I have 2 thoughts: First, some of these groups have been so use to wallowing in all this money, they wouldn’t announce a cure even if they found one. Having all this money is just way to cool. And second, the Cancer industry for instance is making trillions of dollars providing experimental medicine for cures. Thankfully there are many who do recover. Was it the drugs, or was it something else? So even if they did find a one dose pill or shot that cured serious health issues instantly, look at all the money Big Pharma would lose out on. That is , unless this one dose cost $500,000. It’s possible there some sort of “scam” going on, but folks like us will never know for sure. Great cause, however walking in traffic has resulted in several firefighters being run over. I’m surprised lawyers and insurance folks let this continue.